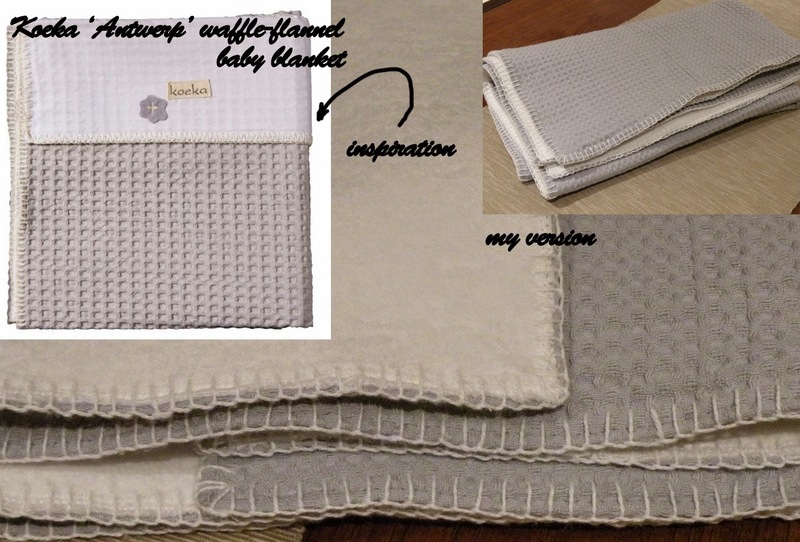 Here is my newest creation of this very new year: a knock-off of Koeka's 'Antwerp' baby blanket! It is a lined blanket: waffle cotton lined with soft flannel. You can use it for the baby bed, but also to keep the baby warm when holding her. My version is slightly smaller than the original size and though it looks simple it was probably the most challenging of my Koeka knock-off projects! It involved a lot of pressing, steaming and pinning to have the size right, because cotton flannel has a really annoying stretch to it. On the bright side it is nice, fluffy and comfortably warm for the winter. Lovely! It is important to use 100% cotton materials for all your baby stuff to prevent overheating! 1. prewash and press both fabrics - it is important to let them shrink before sewing the two layers together! 3. Cut the ready-made blanket to size. Mine had rounded edges which I removed by shortening the fabric. Finish the edges of the ready-made blanket with a zigzag stitch. Before doing that use stay-stitch to prevent the fabric from stretching. If your fabric still stretches like mine you can correct it by steaming and pressing the edges throughly. 5. Start at one side by folding the seam allowance of the waffle fabric under. Keep the flannel and waffle fabrics in one line. Carefully press the layers before sewing! 6. Carefully pin the layers again, lining up the sides using the squares of the waffle fabric as a guide. Attach the layers like above, one side at a time.